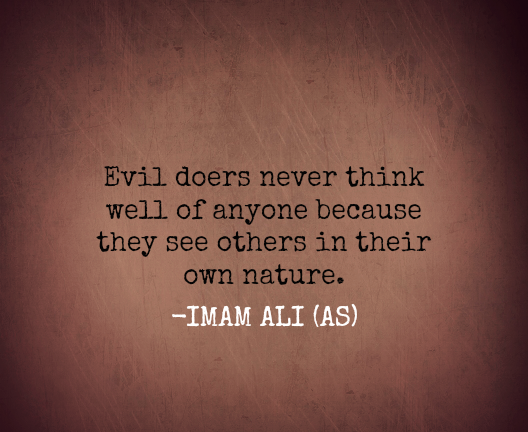 Imam Abu Hanifa: Think good of others; make excuses for them! “A man once came to the learning-circle of Imām Abū Hanīfah (may God have mercy on his soul) and asked the great Imam whether or not his neighbour was a Muslim. He asked the Imam that if his neighbour died, if he had to wash his body, bury him, and pray the Janāzah prayer over him. The students all looked around at one another, confident that this matter was quite easy. They looked to the senior most student-scholar of the gathering, Qādī Abū Yūsuf (may God have mercy on his soul), who also had the same look on his face that this matter was quite clear. Abu Yusuf confidently said to the Imam that the opinion of all the scholar-students present was that this man was not a Muslim. A hush fell over the students. 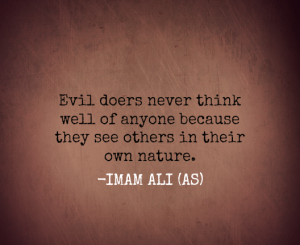 They thought to themselves: How could the great Imam make such a statement? How could he not only give this man excuses, but then say that every believer should have a similar creed? Abū Hanīfah continued, “I will now explain to you why I have made such a statement and tell you why that perhaps this man’s creed is a model for all believers. So here, Fir`awn saw the sign of Allah but it was too late for him since he brought faith only after seeing. So perhaps it may be that this man is saying he has no faith in those types of signs of Allah that when upon seeing them, it is too late for him to benefit from such a witnessing. “As for the second statement, that he says he doesn’t fear God. Now, you know that on the Day of Judgment, Allah will have complete dominion over all things and there is no one who can question Him in His decisions and choices. He has the choice to judge with fairness and equity or to judge without it. Yet, He says that He will judge with truth and balance, “…and they shall be judged with truth and they shall not be wronged.”, and in another place, He says, “…and they shall be judged with equity.” So perhaps it may be that this man is saying that he doesn’t fear that Allah will judge without truth and fairness, and he has full certainty that God will judge with fairness. “As for the third and fourth statements, wherein he said that he has no hope for Paradise and no fear of the Hell-fire. We know that both of these things are creations of Allah, and they have no power or authority to determine who will enter them and who will not. Only the One who created them has the authority to decree who will enter Paradise and who will enter Hell-fire. Why should anyone fear Hell or put their hope in Paradise. So perhaps it may be that this man is saying that he doesn’t fear Hell or hope for Paradise since he knows that God will decide who goes where. “As for the fifth thing, which is that you say that when you see him praying, he doesn’t make any bowing or prostration. Know then that the Prophet said that a believer has six rights over another believer: when he meets him, he should greet him; when he is sick, he should visit him; when he invites him, he should accept the invitation; when he sneezes, he should pray for mercy on him; whether he is present or absent, he should think only good of him; and when he dies, he should pray the funeral prayer over him. Now, when this man prays, he is only standing and not making any bowings or prostrations. So perhaps it may be that this man is taking part in a Janazah prayer that is going on anywhere in the Muslim lands when you see him like this. We know that one does not have to be present in front of the dead body to pray the Janazah prayer, as the Prophet prayed the funeral prayer of the Negus (who was in Abyssinia) while he was in Madinah. So perhaps he is always praying the Janazah prayer for any Muslim that has passed away and therefore fulfilling his obligations. “As for the sixth thing, which is that he says that he eats meat that is already dead (al-maytah). Know that the Prophet said in a hadith, “Made lawful for us are two bloods and two dead meats (Uhillat lana al-damān wa’l-maytatān) [i.e., the two bloods are the liver and spleen of a lawful animal and the two dead things are fish and locusts… a person may freely eat these if he chooses]”. So perhaps it may be that he is referring to dead fish or dead locusts that he finds and he eats of them. So therefore, perhaps this statement is correct. “As for the seventh and final thing, wherein he said that he loves fitnah and hates the haqq. How is he any different from any of you in this statement? When he said that he hates the haqq, don’t you recall that the Qur’an says, “… and the stupor of death will come in truth.” There is not a man amongst us who loves the stupor of death and does not hate it. No man in his right mind would love the stupor of death, so perhaps it may be that he when he says he hates the truth, that he is referring to this. Now, the Qur’an also says, “Indeed your wealth and your children are a fitnah.” There is not a man amongst us who does not love his wealth and his children. What makes him any different than us? So perhaps it may be that when he says he loves fitnah, that he is in fact referring to this. Those who were present were astonished and amazed by the Imam’s insight, intelligence, leniency, and wisdom. A hush fell over the students and scholars as they became silent out of respect. Imām Abū Hanīfah had spoken. Unlike Imam Malik, who only discussed situations which had occurred and used a lecture style format, Imām Abū Hanīfah’s pedagogical approach was based on setting up hypothetical situations and asking his students to debate a topic using principles of fiqh – similar to the classroom dynamics teachers are asked to cultivate nowadays, where it’s less chalk and talk or sage on stage more acting as a facilitator to encourage collaboration, discussion, independent thinking and reasoning, etc.